First opened in 1928, the Lincoln Theatre is a landmark in African-American and jazz history. 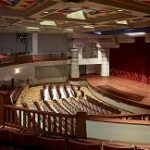 Having recently completed a $13.5 million renovation funded by a partnership of public and private support, the Lincoln has reopened as a multi-use, state-of-the-art performing arts and education center serving the diversity of the Columbus and central Ohio community and ten resident Columbus arts organizations. 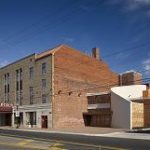 The restoration is the foundation of revitalization plans for the King-Lincoln District, providing a bustling hub of activity 365 days a year with performances, rehearsals, and classes in the performing arts, as well as a wide variety of community events such as film festivals, meetings, and receptions. First floor – This unique 566-seat Egyptian Revival style theatre is equipped with state-of-the-art sound and lighting, digital recording and broadcasting capabilities, and an all-digital projection system. Second floor – Equipped with sprung flooring (a special shock-absorbing floor covering), the second-floor ballroom will serve the Lincoln’s10 resident arts groups with space for auditions, rehearsals, performances, and classes. It will also be available to the public seven days a week for events, weddings, meetings, and parties. Third floor – The Jazz Arts Group’s innovative Jazz Academyoccupies the entire third floor of the building. This 5,000 square foot, American music education facility includes rehearsal rooms, a keyboard/media studio, recording lab, and multi-functional instructional classrooms.